I was curious enough about where The Hunter Chronicles is going that I decided to read book 2 even though I stand firmly on the fence of whether or not book 1 was convoluted or a good read. Over the course of the last few weeks, I found myself thinking about Sky and his uncle. The adventure continues for Sky Weathers and his gang of weapons-building monster hunters. Plenty of twists and turns, monsters, and high adventure. Surprisingly, I liked The Legend Thief so much more than Return to Exile, even though I was confused by some parts of it. Patten establishes a rich Hunter Chronicles ‘jargon’ however I found myself always asking, ‘now what is this again?’ I also think that there are way too many characters in this book that don’t really ‘add’ anything to the story, especially since the series is geared towards middle schoolers. These additional characters and the jargon are probably why I was confused at times. I think the idea that this book is a puzzle and the reader is supposed to put the pieces together. I’m not sure I want to think that hard when reading a kids book. I will probably read book 3 but I’m not going to run out and buy it right now. It was a nice distraction but it was just eh. 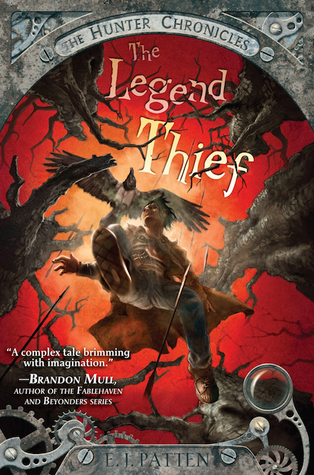 This entry was posted in Fantasy, Middle Grade and tagged E.J.Patten, fantasy, middle grade, Middle grade reader, Sky Weathers, The Hunter Chronicles, The Legend Thief. Bookmark the permalink.